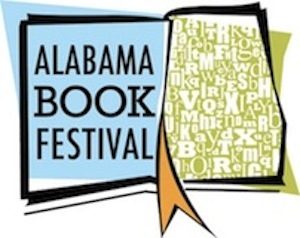 Local meteorologists are predicting sunny skies and warm temperatures for this Saturday’s Alabama Book Festival (ABF). Now in its sixth year, the Book Festival will again take place in historic downtown Montgomery at Old Alabama Town on April 16. Some 4,000 visitors from around the country are expected to gather in the state’s capital to meet with and hear from their favorite authors, scholars, and musicians. The free, public event kicks off at 9 a.m. with more than forty writers and performers making appearances in six venues spread out over the grounds of the nineteenth century village. Activities conclude with a 4 p.m. staged performance by the Alabama Readers Theatre of F. Scott Fitzgerald’s short story “The Ice Palace,” one of his few works set in Montgomery. Programs and activities will include author appearances, book signings, musical performances, and an exhibit area featuring literary organizations and vendors selling books and other items of interest to booklovers. Capitol Book and News will be on hand with the authors’ latest works for purchase. A children’s activity area, organized by Alabama Public Television, is sure to make this a day of fun for the entire family. Again this year, the Alabama Book Festival will feature a diverse group of authors in all stages of their careers. Poets, novelists, memoirists, short fiction writers, and creative nonfiction authors will share their work and chat with the audience. Saturday features internationally acclaimed poet, playwright, and Harper Lee Award recipient Sonia Sanchez. Additional Harper Lee Award winners Rick Bragg, William Cobb, and Wayne Greenhaw will also read from and sign copies of their latest books. Best-selling authors Erica Spindler and Mark Childress will also be on hand. Poets Melissa Blackburn, E.E. Wade, Tony Crunk, Jake Adam York, and Randall Horton will offer contemporary verse. Alabama’s next generation of writers, represented by winners from the state leg of Poetry Out Loud and from the Alabama High School Literary Arts Awards, will also give readings. In addition, the Alabama Center for the Book will present winners in the Letters About Literature contest, which features students writing to their favorite authors. And this is only the short list. To commemorate the Year of Alabama Music, the Book Fest will include Alabama singer/songwriters Janet Simpson-Templin and Dan Farmer. Simpson-Templin is best known for her work with the neo-psychedelic Teen Getaway and the Americana group Delicate Cutters. Her songs take inspiration from the natural world, often blending the divine or esoteric with the tangible and mundane. Her lyrics reveal her Southern roots, her ties to her family, and the landscape of the North Georgian Appalachian foothills where she was raised. All of this is channeled through haunting melodies, flavored by country, pop, folk, and old fashioned rock and roll. Farmer, a member of the popular country band Crooked Road, is a songwriter and solo performer in his own right. Growing up in the mountains of South Carolina and the foothills of Alabama, Farmer absorbed the music of his Southern upbringing. His introspective and celebratory lyrics cover subjects from love found to love lost, from black crows to lottos, liquor, and souvenirs. The music begins at 2:30 in the Alabama Writers’ Forum Tent. In years past, the Alabama Public Television children’s activity area has proven one of the event’s most popular venues. This year the North Tent will host this popular kid-friendly arena. Meeting a “real-life” author is a formative experience for children and adolescents. In addition to meeting some of their favorite authors, children will enjoy educational games, arts and crafts, and appearances by costumed literary characters such as the Cat in the Hat, Arthur, and Clifford. The adjacent Kiwanis Park also offers a unique playground where kids can burn off energy. ABF 2011 will also entertain young readers with an appearance by Eric Litwin, also known as Pete the Cat. Authors of young adult books include Chandra Sparks Taylor, Roger Reid, and Ted Dunagan. Impact Alabama will also be on site to offer free vision screenings for children ages six months-ten years. Again this year, the Alabama Writers’ Forum will offer educational outreach programs for River Region teachers, students, and seniors in conjunction with the Book Fest. The events will include a discussion with memoirist Richard Goodman, a poetry reading for students with Sonia Sanchez, and a creative writing teacher workshop with authors featured at the Alabama Book Festival. The Montgomery City-County Public Library and the Forum will host author Richard Goodman presenting Tell Your Own Story: Starting with Place on Thursday, April 14, 2:30-3:45 p.m. at the E.L. Lowder Regional Library. Geared toward seniors, this program is free and open to the public. Goodman is a creative nonfiction writer and memoirist. He has taught workshops in Montgomery and was recently a guest teacher at the Auburn University Osher Lifelong Learning Institute (OLLI). A faculty member in the Spalding University brief-residency MFA Writing Program, his books include the recent A New York Memoir, The Soul of Creative Writing, and French Dirt. Contact the library to register. On Friday, April 15, acclaimed poet, playwright, and essayist Sonia Sanchez will address English students in grades nine-twelve at Montgomery’s Carver High School. A Birmingham native, Sanchez is the author of sixteen books, including Homegirls and Handgrenades, Shake Loose My Skin, and most recently Morning Haiku. Her many honors include the National Endowment for the Arts Lucretia Mott Award, the Langston Hughes Poetry Award, and the Harper Lee Award for Alabama’s Distinguished Writer of the Year. On Friday, April 15, Alabama teachers in grades seven-twelve will attend a free, day-long creative writing workshop at Troy University, Montgomery Campus with two excellent workshop presenters, memoirist Richard Goodman and poet Tony Crunk, both award-winning writers and outstanding creative writing teachers. Also scheduled is fiction writer and poet P.T. Paul, who will read from her novel To Live and Die in Dixie during the lunch break. All three writers will read from their work at Saturday’s Book Festival. For more information, contact Nancy Hutcheson in the Alabama Writers’ Forum office at 334-265-7728, toll free at 866-901-1117 or e-mail her at writersforum@bellsouth.net. The Alabama Humanities Foundation, a state program of the National Endowment for the Humanities; Alabama Library Association; Alabama Public Television; Alabama State Council on the Arts; Alabama Writers’ Forum; al.com; Capitol Book and News; City of Montgomery; LWT Communications; Montgomery Advertiser; Montgomery City-County Library System; Montgomery Museum of Fine Arts; Montgomery Parents magazine; Montgomery Prime magazine; NewSouth Books; Old Alabama Town/Landmarks Foundation; River City Publishing; South Arts; Troy University; Vulcan Materials Company; and other corporate contributors. April reviews include books by Alabama Book Festival featured authors Melissa Dickson Blackburn, Jake Adam York, Mark Childress, Roger Reid, and Keith Thomson. Don’t see your favorite authors’ books reviewed? Simply key their names into our searchable archives. You’ll find them there. Do you have news to spread? Submit your items to the AWF Literary News monthly e-newsletter. It’s easy. Simply e-mail: 1) two-five paragraphs in an editable format such as Word or Rich Text Format; 2) a digital graphic such as a photo or logo in JPEG or GIF format with an RGB color palette. (We can not accept CMYK or gray scale files) Please include photo credit; and 3) a Web link to your complete story or Web site. Send your information to gambledanny@bellsouth.net or phone 205-665-7986. Please include your name, e-mail address, and telephone number. Deadline: 20th of each month.